Because of the fact that this project has a lot of code, I will be only showing you every time, the code for each of the respective componet (Model, ModelView, View) while working a particular feature. Of course you can download this project from the bottom of this post so you can get the most of it. (In fact I strongly recommend you to do so). Let’s start. First of all you need to have the Chinook database created in your SQL Server instance. I have created a new empty ASP.NET Web Application in which I installed the Web API core libraries from the Nuget Packages.. Then I created a new Web API route in the Global Configuration file “Global.asax” (which I also created”). As we mentioned previously we want first to find an Artist. So what we need is a input element and a button to search artists. Inside the Model folder add a new “DTO” folder and create a class named “ArtistDTO”, pasting the following code. Inside the “Controllers” folder add a new Web API Controller class named ArtistsController. Paste the following code..
We only need a simple Method to find Artists by name or more specifically, find all artists that their name contains a specific word. When those artists are found, a list of ArtistDTO is returned in JSON format. Before binding the returned data to our ViewModel, first let’s bind the click event of the button to a ViewModel’s function that calls the above GET method. The required HTML elements would be..
You need create an “Artist” class in your index.js file. The button with id=”btnSearch” has it’s click event bound to a ViewModel’s searchArtists function. This function will call the Web API action we created previously and fill a ko.observableArray() ViewModel’s property named “ArtistsSearched”. All we need to do now, is to bind this ArtistsSearched observable array to a table, using the Knockout’s foreach attribute. You will have noticed that the last cell has a button with it’s click event bound to a $root.showArtistAlbums expression. We added the $root word so that we can move up to the ViewModel’s root functions. Otherwise you could only see only functions existed in an Artist object (we don’t have any). This has to do with the current Knockout context you work with and since you used the “foreach: ArtistsSearched” data-bind, everything inside it represents an Artist object. At this moment you should at list be able to search for Artists. 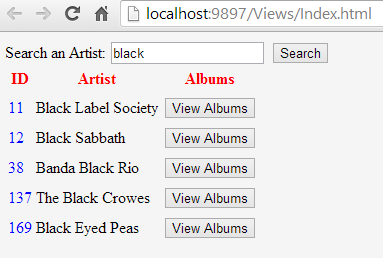 Now we have to display all albums for a selected Artist, that is to implement the $root.showArtistAlbums functionality. Again let’s start from the DTO objects. Add a new class named “AlbumDTO” inside the DTO folder. Then add a new Web API Controller class named “AlbumsController” as follow. Now again, we need to bind this ko.observable array to an HTML element in the View. Instead of using a table, this time let’s use a select list. which indicates that a list of albums will be bound to the options list of a select HTML element. For each option, the Album.Title property will be used for it’s text property, while the Album.AlbumId will be used for it’s value. Last but not least, we have bound the select element’s list ‘change’ event to a “showAlbumTracks” function. This function accepts as a parameter the selected dropdown list item’s value and is supposed to display the respective selected album tracks. Let’s start over, once again. We need to create a TrackDTO transfer object inside the Model/DTO folder as follow..
And of course, a Web API Controller class, named TracksController which will be able to return all Tracks according to an AlbumId parameter passed. Notice the self.CurrentTemplate Track’s property. We are going to use this property in order to alternate between different templates in the View’s side. In other words, we will create two different templates for displaying tracks. One to display them (displayTrack) and another for editing (editTrack). Only one template can be active at a time and that depends on the corresponding CurrentTemplate property. We need to add another ko.observableArray() in the ViewModel for holding the Track list to be displayed in the respective template. I believe now it’s a good time to show the complete code for our ViewModel. Now to display the current AlbumTracks array we need to add a table. This table though will make use of the template data-bind. First let’s add the table. Notice that for each Track the respective ‘tr’ being displayed depends of the CurrentTemplate value. In Knockout, you can create templates simply by creating scripts with their type=”text/html”. Let’s create the two templates we mentioned before, one for displaying tracks and another for editing them. Add those scripts after the title HTML element. In the “editTrack” template, I used a select tag to display the all Genres available. I won’t explain how I did that, you can check the code inside the project (of course I followed the same procedure). To update a Track you need to add another PUT method to the TracksController. Let’s see our application in action now (you may have to click on the following GIF image to see it working). Line 4 of the first code sample puzzles me a bit, I was expecting a Select tag containing options. Creation of HttpResponseMessage goes a bit fast for me, I will look it up. I prefer code commands to state what it achieves, not what language features is used. I like simple to understand code like ajax calls that take prepared arguments like “url” and “data”, not long calls with inline arguments creations. But that all a matter of taste. Good job. Whether I will start using Knockout is another matter. Currently I lean more towards Bootstrap because I feel it’s demands less additions in the html markup and more controle over databinding. But I am a newby w.r.t using databinding js libs. Using the first option from a select element to inform the user that something can be selected doesn’t feel right. I feel the html5 standard should allow placeholder not being an option.